Join us as we honor Mary Julia Baldwin on her birthday this year by raising funds to restore her bed. As the full-scale renovation of the Alumnae House gets underway, Katherine Jackson Anderson '80 is hard at work making plans for the interior design of the historic home. Those plans include restoring transformational leader and namesake, Mary Julia Baldwin's bed and placing it in one of the bedrooms of the home. She is, after all, the ultimate alumna and should have a presence in the Alumnae House. 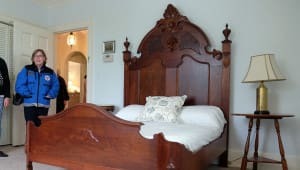 Ms. Baldwin's bed dates back to the late 1800s during the time when she led Augusta Female Seminary, which was later renamed for her, through its golden age. The three-quarter bed is made of walnut and is a solid, beautifully crafted example of Victorian-era workmanship. This antique bed is more than a gorgeous piece of furniture — it represents the legacy of a woman who is largely responsible for Mary Baldwin University's longevity and progress, earning the institution a reputation for providing personalized educational opportunities that help students exceed standards and anticipate future societal needs. In the true spirit of Mary Julia Baldwin, we continue to celebrate our enduring heritage while wielding the courage to see the possibilities ahead. Together, let us celebrate the foresight, courage, and commitment that Mary Julia Baldwin displayed in our foundational years — values we continue to live by today. Mary Julia Baldwin was an avid animal lover, and cared for a number of birds, cats, and dogs during her lifetime. Later in her life, her dogs Midget and Beauty followed her everywhere. Students clipped so many souvenir curls off of Beauty that he was in danger of being trimmed bald. Sometime prior to 1880, two terra cotta sculptures of Beauty appeared on the pillars at the front of the Administration Building. The students renamed these sculptures Caesar and Pompey, then Blucher and Wellington, and later Ham and Jam — two important ingredients of Sunday night suppers. Show your love for Ham and Jam today with a gift to support Baldwin's bed restoration. During the Civil War when Yankee soldiers frequented Staunton to procure supplies, Mary Julia Baldwin proved her mettle by keeping the seminary open when many closed, and by keeping her students safe and relatively well-provisioned for the times. Prior to a Yankee inspection, Baldwin, her co-principal Agnes McClung, and their students came up with a plan to keep their supplies intact. With 40 barrels of flour on hand, the girls took their crinolines and draped them over the barrels to look like dressing tables. The remaining flour was sewn into a mattress, and a student chalked her face to look like an invalid. The soldiers left empty-handed, thanks to clever adaptability on the part of the women. Make your gift to honor the quick wit and composure of generations of Mary Baldwin women. Since 1898, Founders Day has been held each year on the Thursday closest to the October 4 birthday of Mary Julia Baldwin. Founders Day honors the university's two founders, Rufus W. Bailey and Mary Baldwin. For the senior class, Founders Day marks the day they wear their caps and gowns for the first time. This tradition began in 1930 under President L. Wilson Jarman. This year, Founders Day falls on October 6, two days after Baldwin's birthday. We will close the bed restoration project in tribute to her. Help us lay the foundation for this exciting historical project. Augusta Female Seminary thrived under Mary Baldwin and Anges McClung's leadership. Baldwin took on the curricular responsibilities while McClung managed domestic matters. Baldwin's leadership ushered in the golden age, beginning in 1866 and concluding with her death in 1897. When she acquired the school in 1863, there were 80 students, one building, almost no furniture or equipment, capital or staff. At the end of the golden age in 1897, when Baldwin passed away, there were 250 students, five buildings, financial stability, and competent faculty. By that time, the seminary was considered one of the finest educational institutions for women in the South. Without her vision and her foresight, the university would not exist today. Your gift celebrates a truly remarkable leader and 175 years of commitment to academic excellence. The Alumnae Association had a memorial window made as a tribute to Mary Julia Baldwin, and it was dedicated to her on May 24, 1901 during a ceremony led by her lifelong friend and advisor Mr. Joseph A. Waddell. The gorgeous stained glass window, created by William Reith of Philadelphia, features the Baldwin family crest on which our university seal is based. The window now hangs prominently in Grafton Library as a testament to Mary Baldwin's courageous spirit. Make your leadership level gift today to honor her legacy.